Rousseau’s Dog is great book that leads the reader through the twisted path and dark passages that was Rousseau’s existence. While the book covers a substantial part of Rousseau’s life, it centers on the period in which his life intersected with that of the great David Hume. In fact, the title of the book is both a reference to a real dog, and a metaphor for the relationship between he and Hume. After he finds himself on the run from the King of France, the terminally paranoid and always ungrateful Rousseau finds himself thrust upon English shores His salvation comes in the form of David Hume, a portly man of nearly unparalleled intellect. In a prime example of the old adage, no good deed goes unpunished; Rousseau turns on Hume, who seems totally perplexed by the illogical actions of the man he tries to befriend. Hume, to his credit, never returns in kind the attacks he endures from Rousseau. 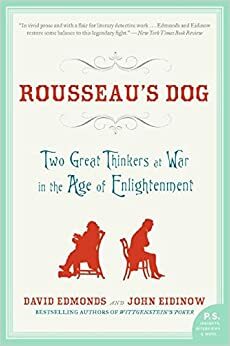 Of course there is much more to Rousseau’s life then his time spent with Hume, and this book also brings much of this to light. His affairs, his abandonment of his children to orphanages, and pattern of betrayals he leaves in his wake. It is all here. All in all, Rousseau’s Dog gives an unparalleled peak into the mind and times of Jean-Jacques Rousseau.